The weekly candle chart for the usd to cad currency pair, reveals little new detail, other then to reinforce how important the 1.3000 region has now become, and that at move higher will have to break through this level. With three previous failed attempts to move higher we really do have to be patient and wait until this area has now been cleared and then becomes support to a move above. With the moving averages all pointing higher, I do believe this is the critical point in the chart. If it fails, then we may see prices fall back into the sideways consolidation of the last few months, but if it succeeds then we could see a move back to the highs of 2004 when the pair topped out at 1.4000. It is interesting to note that along with several other currency pairs we have seen strong moves, on a day with little news and thin trading volumes which is very odd. Whilst in Canada we have one of the few news items anywhere, with the release of the Housing Starts, this is hardly earth shattering economic news, and with a variation of only 7,000 on last months figures, hardly dramatic. As I have been saying for some time, the currency markets are extremely difficult to trade at the moment, and all are exhibiting signs of structural instability, and are liable to be volatile and unstable for no apparent reason. This morning is a classic example, with only four minor news announcements, the markets have been moving wildly and unpredictably, with the GBP/USD falling 400 pips. 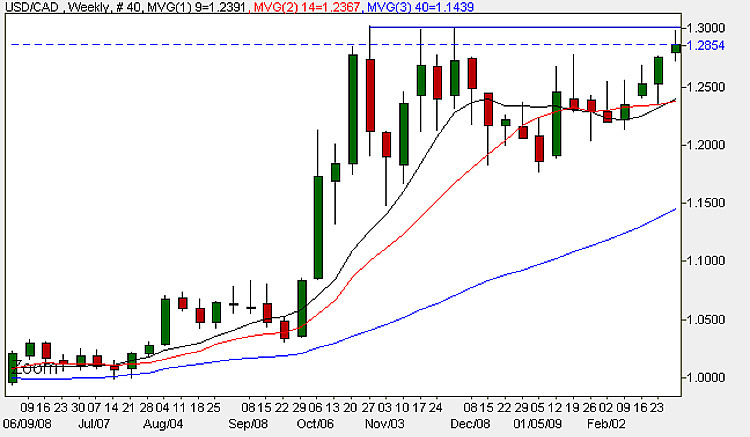 The USD/CAD has been no less volatile with a 250 pip move higher this morning. Whilst I am delighted that we have seen a break higher, we will have to wait and see whether this move is confirmed later in the week, or is simply a false move on thin volumes. All the news is covered for you on the live economic calendar, with the live news feed providing the latest information. The fundamental news releases are also covered daily in the latest currency news video which is updated three times a day. Finally if you are looking for help in finding or choosing an ECN broker, please just follow the link for more details. All the latest prices are now available on the live currency charts.